deployment and computerized energy management, maintenance & guidance. Even on board the air conditioning, refrigeration and waste heat recover are all energy efficient. She is 60m in length and weighs 125 tons, and is capable of holding sixteen plus crew and up to fourteen guests. She can reach speeds of up to 22 knots and when cruising at 18 knots a 75-100% reduction in Green House Gas emissions is achieved, and is able to navigate harbors and inland waterways without producing any emissions. 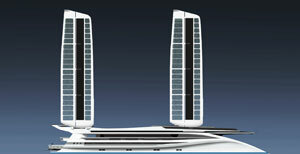 Super Nova and Formula Zero are the only two Superyachts able to utilizesustainable sources of energy from wingsails, PV Cells, and power sailing KERand when combined with plug-in power sources, charge a lithium ion storage system. Super Nova is a certified Carbon Offset Project and can save more than 6,000 tons of carbon dioxide a year and when plugged in can also send 400 Mwh’s of electricity to the grid making enough energy for 7,000 nautical miles of carbon neutral voyages every year. Super Nova’s winning performance, spacious comfort and Carbon Neutral presence is certain to establish her as the Paradigm Superyacht of our age.